New Mexico has some great public lands. The area around Cuba, NM is especially interesting, filled with mesas, washes, hoo doos and whatcha-macallits. After several postponements due to weather and injuries, 15 intrepid walkers enjoyed a terrific Sierra Club-sponsered hike led by Norma McCallan and Michael Richie on April 18 2010. We carpooled from Taos, Santa Fe and Albuquerque and turned west off Highway 550 at Cuba, travelling about 8 miles along State Road 197. After surmising that the initial hike location looked too soggy from the 1.5 inches of rain that fell two days prior, we went on another 5 miles or so and turned onto a dirt road used by an energy company to reach their gas wells. Federal BLM managers like to use the slogan Land of Many Uses and this is certainly true in this corner of the world. 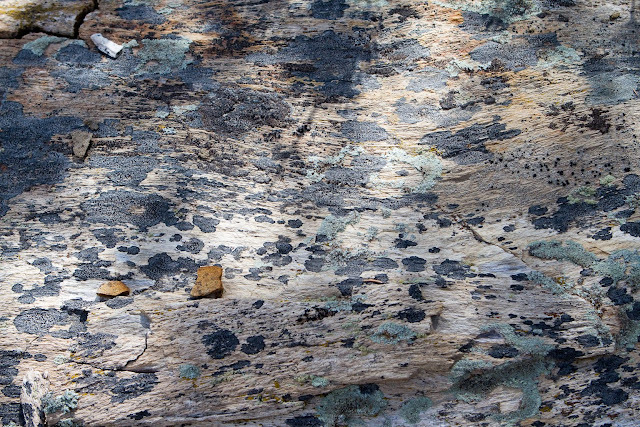 Chuilla is used for cattle-grazing, energy development, firewood-harvesting, target practice, and by aging eco-hikers who love discovering petrified trees, fossils, curious rock formations, and great vistas. Michael Richie has been exploring this country for many years now. He has a website dedicated to promoting and protecting the badlands - visit www.phototreknm.com for much information, maps and photos. One of his current passions is to see the badlands gain status as a Wildnerness Study Area (WSA) in a step to being permanently protected as Wilderness. Nearby Ojito is as an example of BLM land that has gained such status. We hiked for about four hours and in that time saw a variety of geologic formations. We crossed a huge section of petrified tree about 40' in length, lying half exposed along a sandy ridge. There were large boulders perched on top of eroding sedimentary columns. 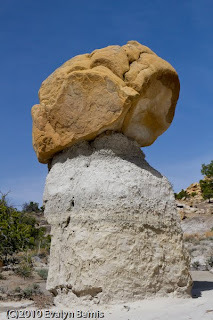 There was a tube of rock that looked like an enormous extruded doric capital. And the best surprize awaited us on top of a mesa. 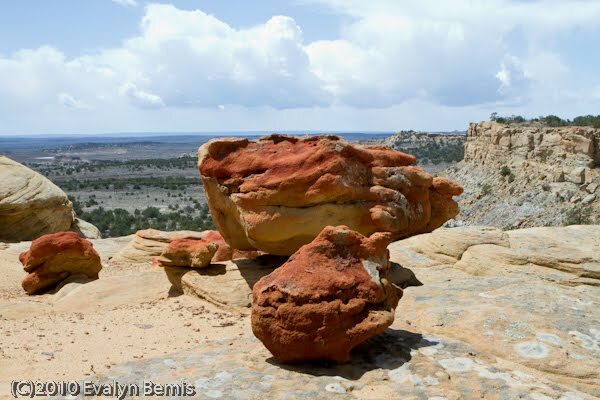 After picking our way up the rocky slope, we hiked out to the end of the mesa to find some fantastically hued stones and a view for many miles. The Ponderosa, Juniper, and Pinon trees in this area deal with the challenge of a harsh climate and conditions on top of the mesas by growing as best they can, wherever they can find a little toehold in the rocks. We saw several that would have made a Bonsai master proud. Sadly, many large and healthy trees on the valley floor had suffered a different sort of fate. We saw evidence of their removal by illegal woodcutters, with needle-covered branches scattered on the ground and freshly-chopped tree stumps all that remained. 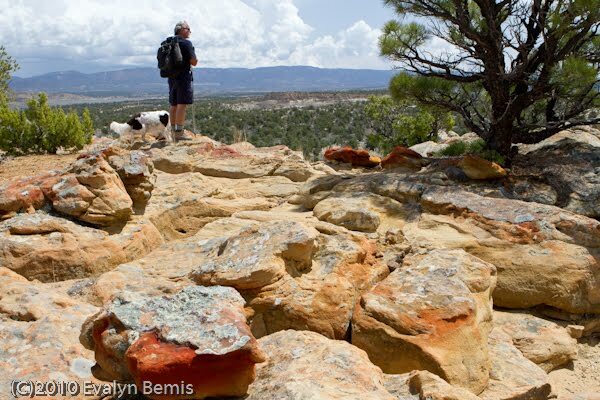 The New Mexico Wilderness Alliance is involved with the effort to create a WSA for these special lands. Keep up with the news at http://www.nmwild.org/.